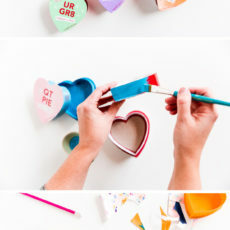 We all know just how close Valentine’s Day is getting, so it feels like a pretty good time to DIY a little something for your V-Day pressies anyway. And it only takes 5 minutes, so you pretty much HAVE to do it. Right? Right! The holographic circles are from Amazon. The peachy pink dots are also from Amazon ($9 for a box of 1,000 stickers!). 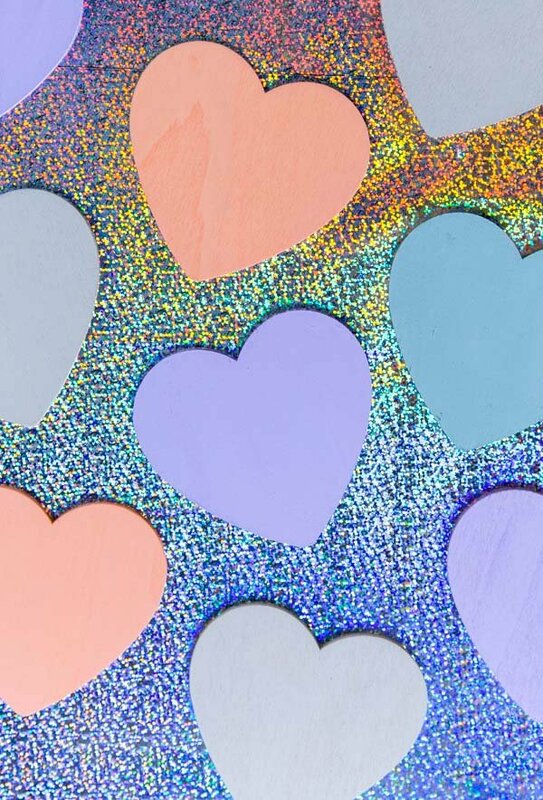 And surprise…the silver stars can also be bought on Amazon OR pretty much any office supply store, where the sticky tabs and yard sale stickers are. You can find them SUPER easily and they’re probably my favorite of all. Once you stick them on your paper in a haphazard (or organized) pattern, wrap your gifts as usual and you’re good to go. I added some pastel painted wood hearts (which are from here) and colorful string to finish things off, but I think they look great on their own too. 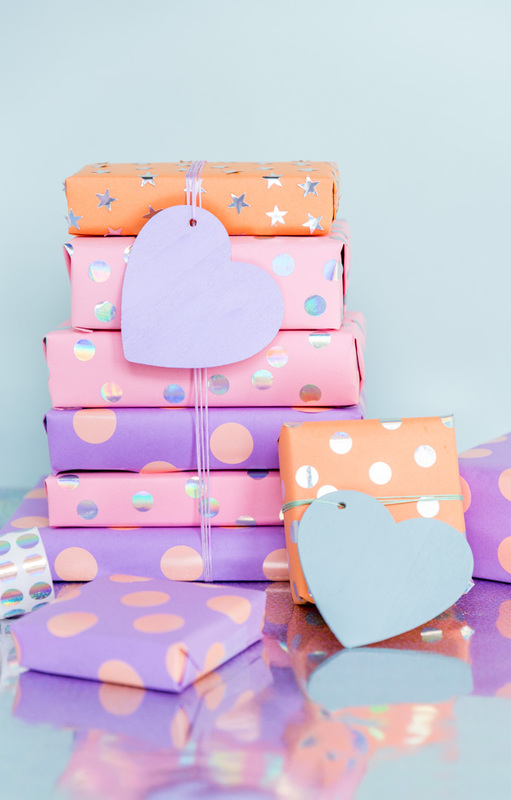 Are you as into DIY gift wrap as I am? What weird(ish) things are you obsessed with? I would love to know! This is so cute! And I love that you can have one roll of paper and make it look different infinitely! Thanks KNC! It’s amazing what you can do with a few rolls of stickers, right? So fun and easy. 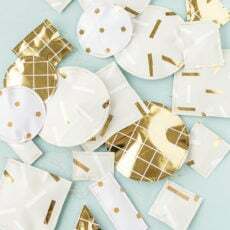 That is such a cool idea, and I love how you combine rather pale colours with silver stickers! 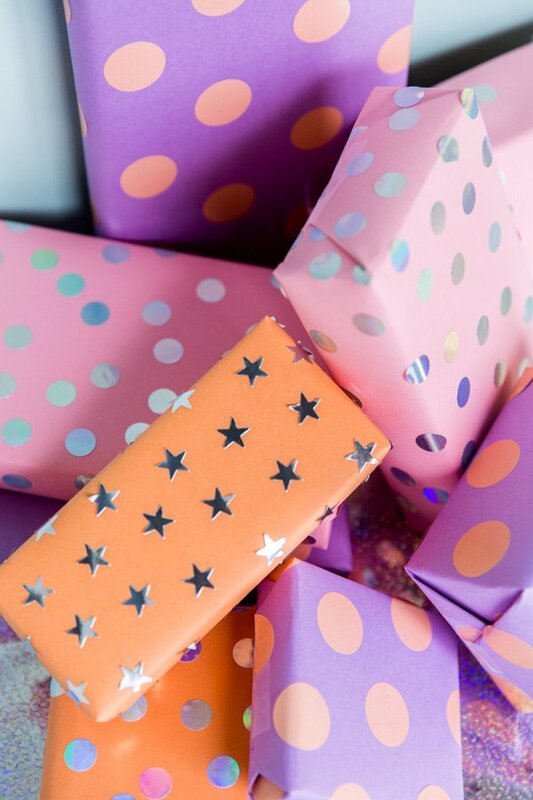 I can totally see you creating your own line of wrapping paper. 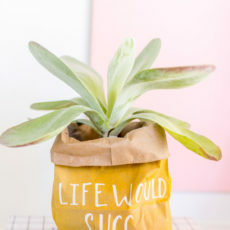 Thanks for sharing such a fun and easy DIY! i agree with you! 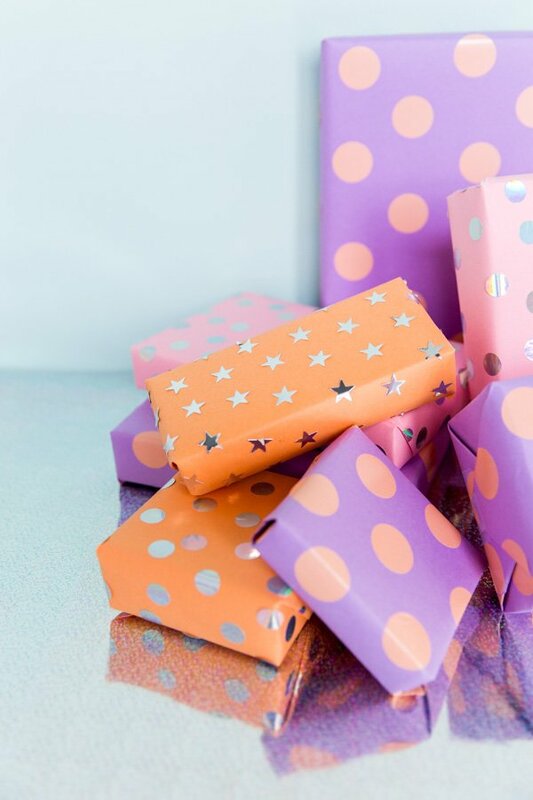 i LOVE wrapping paper. to this day i beat myself up for not buying that flamingo paper at marshalls a couple of months ago. i just wished other people could love it as much. last year for our office xmas exchange, i picked my gift solely because of the wrapping paper. i opened it sooo carefully and i kept it. Haha. Love that Les. 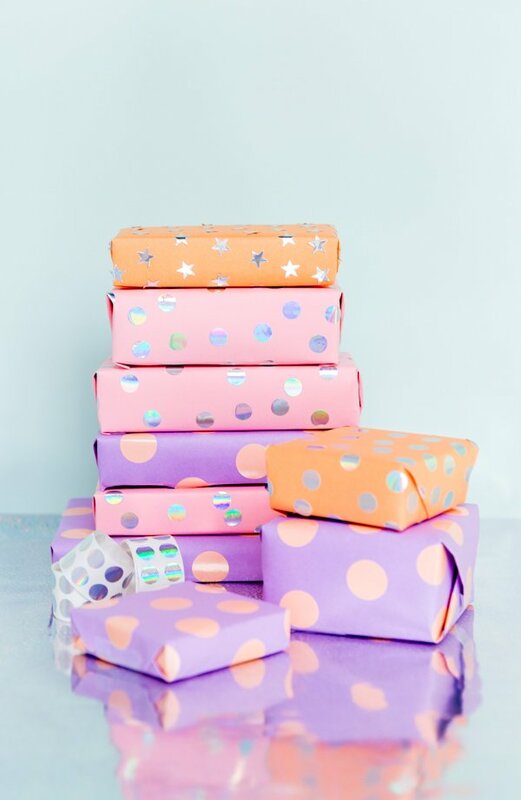 I’ve kept wrapping paper from gifts in the past too. Sometimes it’s just too good to throw away. Love these! So fun. I think they’d be perfect for so many occasions. Thanks Kelsey! Yep, you could totally use this technique for lots of occasions. Good call! Love this idea and how easy and convenient it is! This is such a smart idea, a real time-saver!! Thanks Eleanor, Ari, and Marwa. 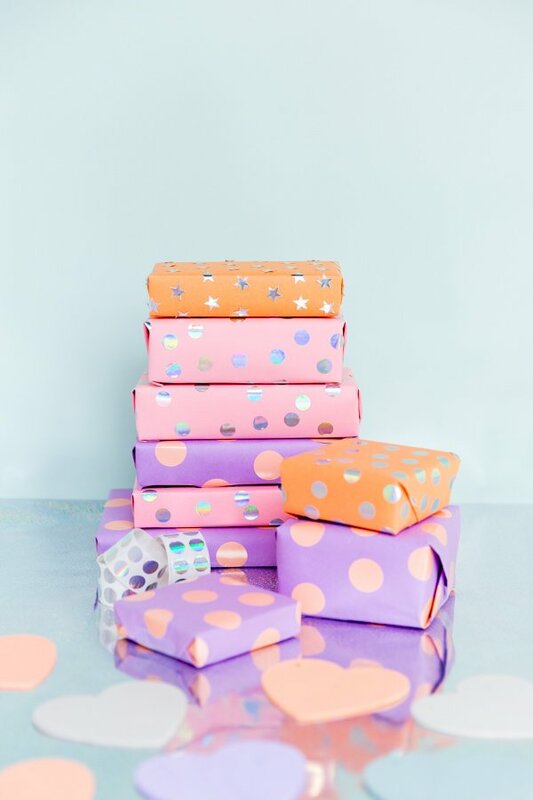 We too are suckers for wrapping paper. It just makes a gift that much better. 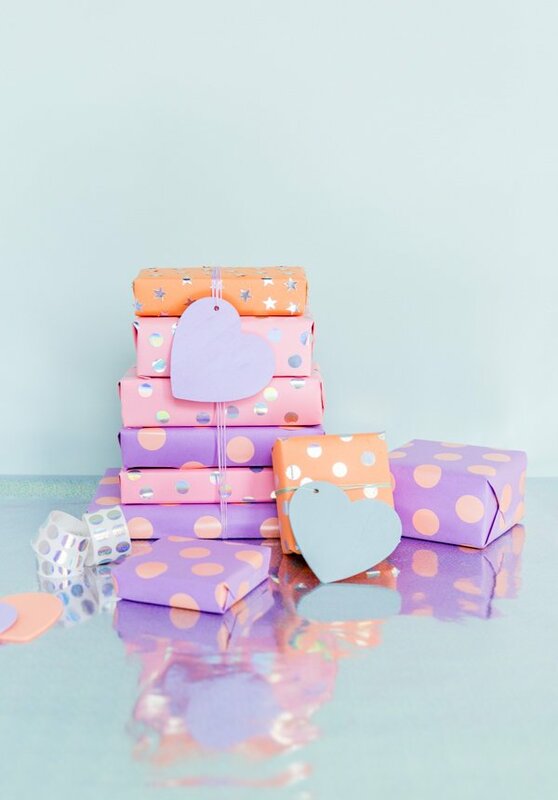 This could quite possible be the cutest Valentine’s grift wrap ever! Pretty cool. That seems so easy. I hate when I should wrapping a gift because I can’t make it well. That is AWESOME and cute u are so creative that’s good thanks for sharing ur creativity I appreciate it THANKS#U ARE AWESOME #CREATIVE POWER!!!!!!!!!!! !